Have you discovered Purple Pumpkin embellishments yet? If not, you really need to - they add a whole new dimension to your scrapbooking!! I just love all their cute buttons and other embellies :D They are having a design team call right now, so if you do love their embellishments and would like to represent them, head on over to their blog and put in an application - i already have!! My 1 lollipop/flower is that cute little white flower in the middle of the doily. 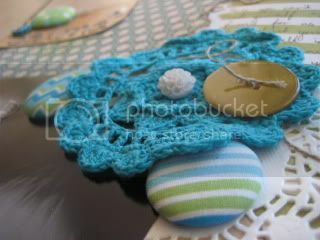 The 2 doilies are the aqua crocheted doily and the while paper doily, and the 3 buttons are the 3 Purple Pumpkin blue/green buttons. I've also added in a couple of MME buttons from the Lost & Found 2 range, which is what the PP's are. And the story behind the title? Well, since Calvin can't say 'v', he calls himself Calma! Cute huh? He's been pretty sick this week. Today is the first morning in 3 days he's woken up without a raging temp, so i'm pretty happy about that. It's meant a lot of snuggle time with mummy, which i can't complain about too much, but it's been difficult to get anything done, that's for sure!!! Today is normally his daycare day, but he won't be going :( Such a shame because i was looking forward to going shopping without a toddler!! 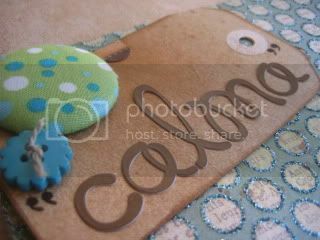 I have photos to print, since this weekend is cybercrop weekend over at Scrapboutique!! Hopefully i'll manage to get out anyway. I'd say i'll end up putting him in the pram and Scarlet in the baby bjorn carrier though - he's not going to want to walk in the mood he's in!! Well, i hope you all have a great weekend, and i might see you around at the Scrapboutique 'Spring Fling' cybercrop! !